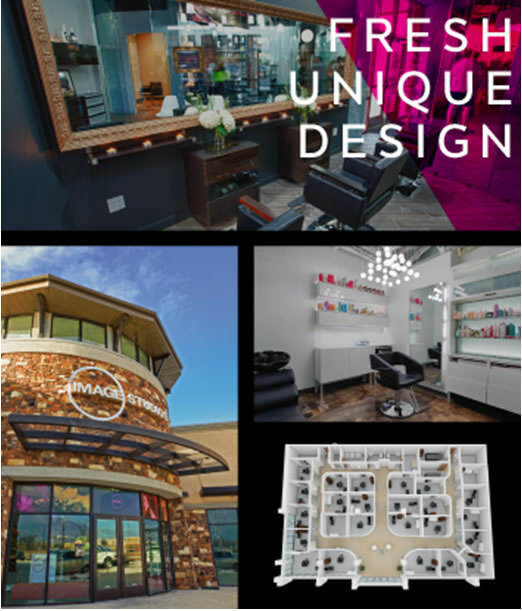 Here's how the Image Studios 360 salon studio concept works: we take large retail space around 5,000 square feet and build out 28-32 salon studios (each ranging from 100 square feet - 250 square feet) that are leased to beauty professionals such as hair stylists, estheticians, nail techs and massage therapists who operate their own business within their studio. It’s like a mini-mall of hair salons all under one roof, and you’re the landlord. 1. Stress-Free Business Model: Image Studios 360 has engineered a successful system that empowers franchise owners to seamlessly control and operate their business while allowing them flexibility to focus on other business ventures. 2. Minimum Employees Required: In most cases, a franchise owner operator can manage three to four Image Studios 360 salons on their own (with the assistance of contract janitorial and repairs and maintenance people). On average, you will need to hire one employee for every fourth salon you open! 3. Marketing & Advertising Assistance: Now to our favorite part! Most of our franchise owners are not from the beauty industry, so they may feel unsure of how to reach this niche market. Our expertise in marketing and advertising really shines as you use our fine-tuned marketing plan to help all your salon studios maintain maximum capacity. 4. Beautifully Designed Studios: We are so proud of the recognition we’ve received by several organizations for our fresh and unique design along with our powerful and effective marketing. It is a breath of fresh air compared to so many other salon studio concepts. Isn’t it time that one finally designed a space for creative individuals? 5. Ongoing Coaching & Support: We are incredibly passionate about this business and we strongly believe that our success lies in coaching and empowering our franchisees on an ongoing basis. Their own personal development as an Image Studios 360 entrepreneur will reflect in the success of the entire Image Studios 360 franchise. In 2009 several creative minds came together and started to discuss the possibility of creating an amazing salon space that offered professionals in the beauty industry something that had not been done before. Something that would truly disrupt the traditional salon business model, and effectively make a much-needed shift in the industry by offering a studio salon space that catered to all beauty professionals, including hair stylists, estheticians, nail techs, massage therapists and more. After many late night meetings, phone calls, road trips across the country, and sketches on who knows how many napkins, Image Studios 360 was born. The right candidate for an Image Studios 360 franchise is someone who enjoys being on the cutting edge and wants to be first at a whole new look! Our brand is pioneering a new look and business model that is changing the salon industry from the inside out, and we’re looking for people who want to take this incredible concept to select markets across the country. Those who may not be familiar with the beauty industry or have extensive business management and ownership experience are not excluded from our selection process. We have the right system to help any of our new franchisee experience success as an Image Studios 360 operator. From the very beginning our core values have been “CREATIVITY + FREEDOM + SUCCESS”. These core values are critically important to us and we only seek individuals who possess those same values. Together we can create an intoxicating formula for success. Please call Bill Terry, Director of Franchise Sales directly at (801) 927-7850. Image Studios 360 is currently accepting inquiries from the following states: Alabama, Alaska, Arizona, Arkansas, California, Colorado, Connecticut, Delaware, Florida, Georgia, Hawaii, Idaho, Illinois, Indiana, Iowa, Kansas, Kentucky, Louisiana, Maine, Maryland, Massachusetts, Michigan, Minnesota, Mississippi, Missouri, Montana, Nebraska, Nevada, New Hampshire, New Jersey, New Mexico, New York, North Carolina, North Dakota, Ohio, Oklahoma, Oregon, Pennsylvania, Rhode Island, South Carolina, South Dakota, Tennessee, Texas, Utah, Vermont, Virginia, Washington, Washington, D.C., West Virginia, Wisconsin, Wyoming.